Prime Minister Narendra Modi often talks about his origins as the son of a chaiwalla. A significant aspect of being a chaiwalla – or a rickshaw-walla, taxiwalla, sabziwalla, etc – is the constantly dangling financial sword of what is called ‘catastrophic health expenditure’: expenses on healthcare being so high people end up taking huge loans or selling assets or giving up all their savings. Perhaps Modi’s family escaped that experience: he has hardly been heard talking passionately about it as he does about other aspects of poverty. Nevertheless, it is something that millions of Indians – especially those in the ‘unorganised sector’ which is more than 80% of our working population – dread, and which many thousands go through each day. Let’s consider an Indian family of four: a school-going boy, his parents, and his dadi-ma. The kid’s father sells tea at a railway station (like our PM’s used to) and the mother takes care of their slum home. They are the quintessential ‘unorganised sector’ family of the Indian economy – no regular and dependable income, no permanent assets, zero or scant savings, and, of course, no insurance of any kind. One day dadi-ma stumbles, falls, and gets her hand fractured (an all-too-common incident with senior citizens). The sarkari hospital is where chaiwallas usually take their mothers. But unless you are one of those fortunate tea-sellers who later became ministers, you cannot expect your mother to receive timely and respectful care, of a good quality, from a government hospital and its overburdened staff. Besides, public hospitals, contrary to popular belief, are not ‘free’ in practice. This was agonisingly evident from the recent incident in Odisha where a man, unable to afford a vehicle, carried his dead wife’s body over his shoulders for several kilometres. Even for the poorest patients, there’s always money to be paid – for transport, or as bribes, or to buy medicines and equipment the hospital lacks because the government ostensibly has better entities than hospitals to finance. Still, the chaiwalla’s got to take his mother to a doctor, and thereby hangs a catastrophic tale. Because for him, even the cost of transporting her to a hospital, let alone paying for the treatment later, could be colossal. Millions of such Indiansslip into profound poverty and almost-permanent indebtedness each year because of healthcare-related expenses. And with increasing corporatisation and privatisation of health services, many of us ‘organised sector’ employees have also started feeling the pinch. Few phrases in the public health literature capture the kind of raw agony that ‘catastrophic health expenditure’ does. I know that well, for my family is a rickshaw-walla’s family. A fractured bone is, for some citizens, an ordinary health-related accident, while for many others it is an extraordinary, debilitating financial incident. Out of the many injustices that plague the world today, this is one of the most devastating. Several enlightened governments (as diverse as the UK and Thailand) have quite successfully tackled this injustice through what is called universal health coverage (UHC). 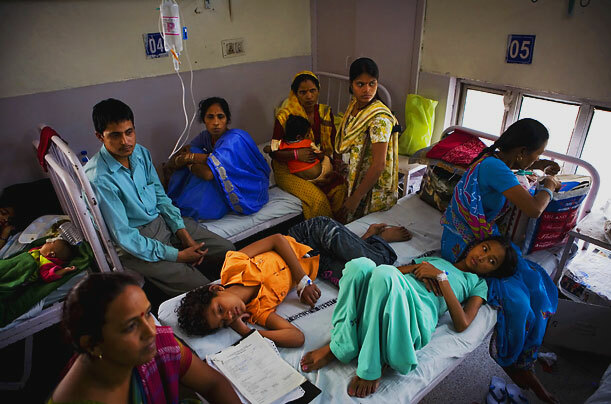 While the Indian state has always provided some kind of ‘universal’ healthcare to its citizens through its own health centres, and recently throughshort-sighted and inefficient insurance schemes like the RSBY, it never fully implemented the two most crucial characteristics of UHC: health services should be of a sufficiently good quality, and citizens should not at any point be exposed to financial hardship. Public health experts have known this for years. Which is perhaps why some of us were optimistic when a new government came to power in 2014, naively thinking it will be bold enough to take a concrete leap towards UHC and acche din. Alas, the government had other ‘more important’ priorities. That makes me revert to our chaiwalla: for him, nothing else is of higher priority than his family’s well-being. Shouldn’t India’s MPs too, first and foremost, strive to ensure good quality health services for their citizens, like leaders of dozens of other nations have? Surprisingly, our generally inept politicians have actually done that, though in a very selective manner: all ministers, babus and other central government employees enjoy what is probably the most generous health scheme in the world – CGHS, or the Central Government Health Scheme. The government spends on average Rs 4,895 per year on every person covered under CGHS (who are a few million), while the average public spending for the health of all Indians (who are some 1,250 million) is about a fifth of that (lesser still for most of us, considering how much this average is distorted by the humongous CGHS figure). We tend to criticise governments for failing to get their priorities right. In this case however, the government has shown exceptional brilliance in prioritising on whatto spend: healthcare indeed is so important that it deserves to be generously funded. But on whom to spend, well, there’s clearly some scandalous selective prioritising. One way we can repair that is by telling our policy makers emphatically that India needs not selective health coverage, but universal health coverage. They should realise that a nation’s greatness is less about a rare chaiwalla ascending to become the PM, and more about the nation’s systems ascending to treat equally a minister’s mom and a chaiwalla’s mom.